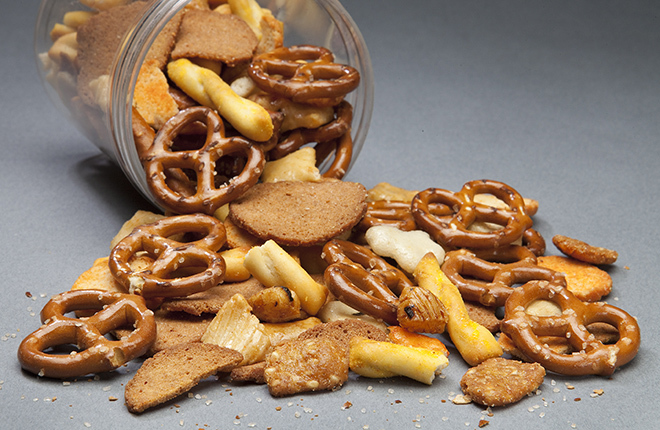 Some snack foods are much higher in sodium than others. An updated database can help consumers make educated food choices. (Stephen Ausmus, D3540-3). U.S. consumers eat and drink too much sodium. Over 90 percent of us consume more than the maximum daily sodium intake recommended by the government, according to national food-intake survey findings reported by the Agricultural Research Service (ARS). Most of our dietary sodium comes from commercially processed and restaurant foods—and reducing sodium in these foods is key to lowering the amount of sodium in the U.S. diet. Since 2010, researchers at the ARS Nutrient Data Laboratory (NDL) have been collaborating on a project to monitor key sodium-contributing foods with the ARS Food Surveys Research Group, the U.S. Centers for Disease Control and Prevention, and the U.S. Food and Drug Administration (FDA). The two ARS laboratories are part of the Beltsville [Maryland] Human Nutrition Research Center. “Based on the national survey, these sentinel foods account for about one-third of the nation’s total adult sodium intake,” says Ahuja. The nutrient content of the foods is periodically assessed by use of objective, nationwide sampling and laboratory analyses to track the progression of important changes over time. Laboratory testing is based on analytical protocols established by the National Food and Nutrient Analysis Program. All foods in the database were sampled and chemically analyzed between 2010 and 2013 to obtain baseline values. The researchers observed a wide range of sodium levels among foods studied. For example, some canned tomatoes had 4.5 times more sodium than others. Among foods categorized as savory snacks and crackers, plain tortilla chips had one-quarter the sodium of hard pretzels. Most of the foods sampled (88 percent) from fast-food outlets or restaurants exceeded the FDA sodium limit for a claim of “healthy.” Consumers and health professionals can use the information to make educated food choices. The dataset can be found on the ARS website by clicking here. The sodium dataset also appears in the annually updated USDA National Nutrient Database for Standard Reference produced by NDL, which itself is imported into multiple computer and online interactive resources, such as the user-friendly ChooseMyPlate.gov. While the purpose of the dataset is to monitor sodium in foods and in the U.S. diet, other agency professionals and public health officials use the information to focus sodium-reduction efforts. Potassium, total dietary fiber, total and saturated fat, and total sugar are also monitored because their levels may change when manufacturers and restaurants reformulate their products to reduce sodium content. A detailed report about the collaborative sodium-monitoring program was published in the March 2015 edition of The American Journal of Clinical Nutrition, and a report on sodium content of popular sodium-contributing foods was published in Preventive Medicine Reports in November 2015.—By Rosalie Marion Bliss, Agricultural Research Service Information Staff. “New Data May Help Reduce Sodium Intake” was published in the January 2016 issue of AgResearch Magazine. Most sodium in the U.S. diet comes from commercially processed and restaurant foods. Sodium reduction in these foods is key to public health efforts. New online dataset supports sodium-reduction efforts.